A wide range of solutions to signal conditioning requirements. Stability of the measurement and flexibility of application are the key features and systems comprising these modules also provide very high reliability due to complete inter-channel isolation. The latest in a line of transducer amplifiers providing features demanded by our customer's experiences of decades of D.C. bridge applications. The bridge supply is capable of operation with Zener barriers. Two sets of on board bridge completion, high performance preamplifier, averaging auto-zero, comprehensive limit detection and wide range active filter are standard. Options include , 4-20 mA output, 8 pole filter, isolation or other high level output conditioning. When high frequency results from D.C. bridge transducers are required, this Transducer Amplifier provides 500kHz bandwidth at 3V RMS. The module provides 0.5 V to 12 V constant voltage supply at 50 mA with balance indicators and bridge completion facilities. The comprehensive controls include balance and auto-zero, switched filter, shunt calibration, output calibration, and output scaling. Integrator module used to provide velocity and displacement measurements to complement an acceleration measurement. The FE-3051-TF is a frequency controlled tracking bandpass filter with a standard range of 20 Hz to 1 kHz. (lower frequency ranges may be specified if required.) 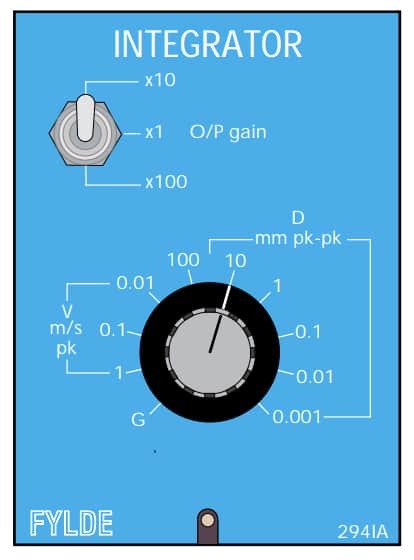 The tracking filter may be connected via the Tracking Ratio Adaptor (FE-3061-TA) to be centered at harmonics of the rotational speed. The filter gives an AC output at unity gain, and also a rectified and filtered DC output at 1 V DC for 1 V AC. The Tracking Ratio Adaptor satisfies the requirement to tune the system's FE-3051-TF tracking filters to harmonics which may be fractions or multiples of a fundamental frequency. This unit accepts the fundamental frequency input from a tachometer transducer which may be a magnetic pick-up or other transducer type. It provides optical isolation and synthesizes an appropriate harmonic frequency from multiply/division factors set by banks of on board switches. High performance charge amplifier with calibrated controls, covering the range 1pC to 50,000pC and developing ± 10V output. The amplifier has good L.F. response and quasi-static performance with high frequency response up to 100 kHz. A range switch and calibrated ten turn dial match the unit to the transducer sensitivity. A separate switch allows the number of mechanical units per volt of output to be set. The module's low pass filter cut off frequency is easily changed using a plug in resistor pack. . A compatible wide range integrator is available - see FE-294-IA. A series of in line head amplifiers which can be used when Charge Transducers have low impedance due to elevated temperature. The FE-074-HA/C is a charge amplifier for application as a head amplifier in IEPE type systems using nominally 2-4 mA. Versions are avaialble with a sensitivity of either 1mV/pC or 10 mV/pC. The unit transmits AC signals on coaxial cable and is compatible with IEPE sources of 2-6 mA. The frequency response extends from approximately 1 Hz to 25 kHz with a dynamic range extending up to 2V RMS. Connection is BNC or microdot input and BNC output. The FE-077-DCA is intended for use with double ended (differential) accelerometers typically used for machine vibration monitoring. This is an ICP device powered by a current in a coaxial cable which also carries the signal to the receiver amplifier. For a compatible receiver amplifier, see the FE-530-IE. This module differs from the FE-419-CDT in giving greater sensitivity at the expense of reduced tolerance of cable capacitance. (2 m cable lengths are recommended.) 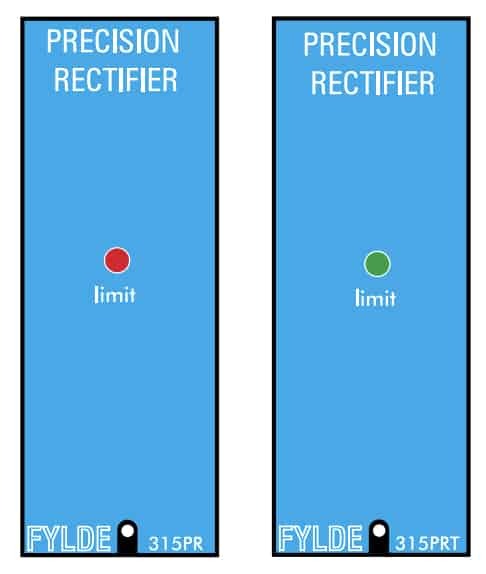 Measurement distance depends mainly on the transducer type and can range from microns to centimetres. It is suited to applications involving extremely small distance variations and fast rise times. Offering very low noise and drift performance, this differential d.c. pre-amplifier has a gain range from x0.2 to x10,000 (±0.1%) using switched attenuator and switched and vernier gain controls. Offset and calibration controls are provided. An on board auxiliary socket can accept a plug in 4 pole low pass filter. A front panel LED illuminates when fitted. A 16-channel digital monitor, the M6-DS is ideal for use in any system where it will monitor the outputs and/or transducer supply from up to 16 modules. The module can measure a.c. with its built in precision rectifier scaled for RMS and also features a peak hold function. A front panel BNC socket enables additional monitoring equipment to be easily connected into circuit. This "instantaneous" frequency-voltage converter responds almost immediately to a variation in rate of incoming pulses, e.g. when applied with a magnetic or optical pick-up . The unit is suited to any frequency measurement from 10Hz up to 50 kHz. Exceptional accuracy and linearity are combined with the very fast response to each edge of the frequency signal.